At Village Green Retirement Campus, we often hear from families who tell us their only regret is that they didn’t encourage their parent to move to assisted living sooner. They can name numerous benefits of making this change, but it often comes down to peace of mind for the family that their loved one is safe and well-cared for. Their only hesitation was in determining if they could afford to make the move. What is Assisted Living and What Benefits Does It Provide? 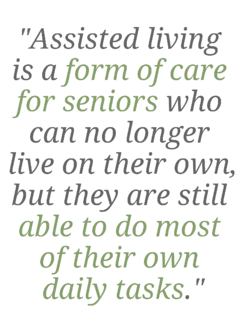 Assisted living is a form of care for seniors who can no longer live on their own, but they are still able to do most of their own daily tasks. Perhaps they can’t keep up with housework or home maintenance and may even struggle to prepare meals. They often need assistance with daily living tasks but aren’t entirely dependent on another person. The benefits of choosing an assisted living center are numerous and vary with each situation. From the adult child’s point of view, they no longer have to worry about their parent getting hurt and being alone or declining health for lack of care. In assisted living, they receive regular attention for their needs by a professional staff. If the adult child lives out of town or has a busy schedule which doesn’t allow them to help with their parent’s needs, assisted living can solve the problem. From the resident’s point of view, they’ve given up the responsibilities of meal preparation, home, and yard maintenance and the myriad worries of living alone, to become part of a community focused on their interests and needs. They might receive more socialization than what they experienced at home if they weren’t able to get out to see friends like they once did. Another benefit of assisted living for the senior is the ability to move up in levels of care as needed. Many seniors start out with minimal care requirements when they move into this kind of community. As their mobility and abilities decline, they can transition to more care without waiting to find a place to live that meets their needs. In fact, some assisted living communities also have nursing care for when the person is no longer able to provide for their own basic needs. Assisted living can look different with each community. Even though they all follow the same basic idea of providing assistance to seniors, the actual services offered may vary by center. Some services are included in a basic package while additional care may be provided at an extra cost. You would want to visit the center and ask questions, so you know what to expect for your parent. How Do You Know If Assisted Living is the Right Move? If your loved one is still relatively independent but could use a little assistance, assisted living might be the right choice. If you feel they need more help than what you can provide, you will find this option gives you peace of mind. On the other hand, if your parent needs a great deal more care or cannot handle most daily tasks, you may be looking at more in-depth care in a nursing center. You can make this decision after talking with your loved one’s doctor or medical care provider and getting their advice on the level of care that will provide the best quality of life for your family member. Many people delay making the move to assisted living because they are concerned about the cost. They are often surprised that the cost of assisted living is generally far less than the cost of in-home care if the resident needs help with several activities of daily living such as meal preparation or personal hygiene. Often, the senior may start with hiring a person or agency to come in for a few hours a week to assist with household tasks. As their health deteriorates, the need for care will likely increase. Instead of a few hours a week, it may become several hours each day to assist with bathing, cooking meals and dressing. At this point, the hourly cost for an in-home health care worker or agency may exceed the cost of assisted living. But, how much does assisted living cost, and what will you need in savings to pay for it? Genworth Financial has compiled a state-by-state list of average elder care costs and information from Washington State is here. 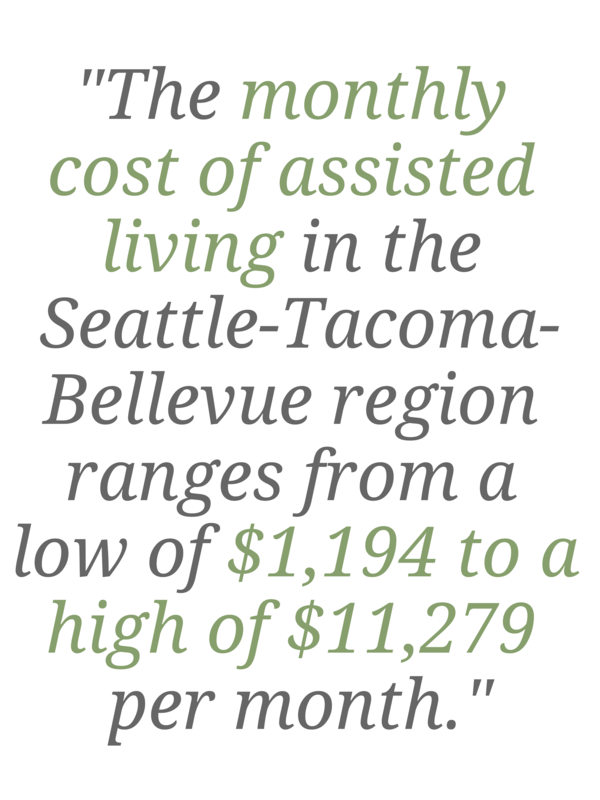 According to the Genworth list, the monthly cost of assisted living in the Seattle-Tacoma-Bellevue region ranges from a low of $1,194 per month to a high of $11,279 per month. The average cost is about $5,407 in monthly rent for an annual cost of $64,890. In looking into the various options, be sure to ask questions about what kind of care is included in the base rental fee. In most facilities, the rental fee covers a single apartment, meals and light housekeeping, but one-to-one care such as help with dressing, bathing, personal hygiene or medications will cost more. If you are trying to figure out how much to budget for assisted living, using the base rental fee might not be the most helpful because many residents will need additional care at an extra cost in the future. The AARP has created an online calculator to help you estimate and compare the average cost of assisted living care and skilled nursing care in various regions. According to the AARP calculator, the cost of assisted living in the Seattle area for three years is about $175,000, while the cost of a private room in a nursing facility would be $329,750. It’s impossible to know how long your loved one might live in assisted living. According to national surveys, the average length of stay in an assisted living facility is about 22 months, but certainly, some residents thrive in assisted living for many years. There are several options to help your loved one be able to afford assisted living when the time comes. If your parent is still independent and not ready to make the move to assisted living, you might want to look into long-term care insurance. In the past, these policies didn’t pay for assisted living or paid only partially, but newer policies have improved. Look for a long-term care insurance policy that includes assisted living and read the fine print. Make sure your loved one would be covered if the time comes that they need to seek out new living arrangements. Long-term care insurance is only an option for those who have a few years to think about the future. However, there are other strategies that can help you if the move is coming in the next few months. Life insurance – if you have a whole life insurance policy that has matured, you can get the money now while the person is still alive instead of waiting for death benefits. If the policy hasn’t matured, you can still find out about cashing it out if the company is willing to buy it back at a percentage of the value. Veterans’ benefits – if your parent has served in the military, they may be eligible for certain benefits that assist in paying for residential care. Aid and Attendance is one benefit that allows veterans or their spouses to receive assistance with assisted living if their income meets requirements. Reverse mortgage – allows one person to still live in the home while the other person goes to an assisted living center. This is the ideal choice for anyone who plans to sell the home someday in the future. Sell the home – if your parent owns their home, the proceeds from the sale could help with the expenses of moving into assisted living. They could also rent it if they aren’t ready to sell to assist with the monthly fees for assisted living. Bridge loan – Your loved one may qualify for a bridge loan to help them finance moving until they can liquidate other assets. If they are selling a home or waiting for other funds to become available, this loan could eliminate the need to wait to move. Annuity – Many seniors invested in annuities because it seemed like a safe way to manage their money. It’s also a good option if your parent plans to sell their home or other property. They pay in a lump sum and receive regular payments for a specified time. When calculating the cost of assisted living, you must compare it to the current expenses of your loved one. They must pay for utilities, food, and upkeep of the home if they can no longer do the work themselves. They may already be paying for help with certain tasks either through an agency or a person who comes to their home on a regular basis. If you add up these expenses, you may discover that the cost of assisted living is cheaper than being a senior homeowner. When you put everything down on paper or on a spreadsheet, it can often make the move seem more affordable. You may have noticed changes in your senior parent. Perhaps they are forgetful or have trouble fixing meals or taking care of the housework. Maybe you’ve been helping them with laundry or basic cleaning. They may struggle to remain as independent as they would like. Many families wait until a crisis strikes before they make the move. If you notice any of these signs, you may want to think about the need for a change before a serious accident results. By planning ahead, you can help your loved one to get settled into a community while they are able to participate in the decisions and remain as independent as possible. Now may be the time to look at assisted living. The first step is to talk to your loved one and get their reaction to this idea. You should ask them if they would consider taking a tour of Village Green to see what it’s like. You can schedule an appointment to visit the center where you and your senior loved one can see where they would be living and get your questions answered before you make a decision. A representative will sit down with you and go over costs and care options so you can determine what you can afford and what your parent needs. You may also want to talk to a financial planner about your parent’s current assets and what steps they can take now to finance their future in an assisted living community. Some assets take longer to liquidate, and you want to know what to expect for the future even if they aren’t ready to move now. If you have questions about what you or your loved one can afford, it’s best to talk with a financial planner, or with experts at Elderlife Financial Consultants. At Elderlife, consultants have a range of financial tools they can talk with you about, from lines of credit and home equity loans to reverse mortgages. Assisted living might be more affordable than you realize, and it might be the best option to give your parent the quality of life they deserve and the peace of mind you want.